I have always enjoyed Lemongrass in Thai cuisine and it’s refreshing aroma in essential oil, but I was never excited about it until I had the pleasure of inhaling pure Lemongrass from India. Most supplies we have in the US are from the Caribbean, which is earthier, and I think flattens out into a nondescript aroma after a short while. Coming from India it’s a different story. It’s bright, crisp, refreshing, lemony and lasting. I am so delighted, I want to pass it on to you. Indian Lemongrass is a wonderfully rich and fragrant oil that energizes the mind and body. It has been used in many Eastern cultures for thousands of years as an accompaniment to meditation and prayer. Lemongrass has been used in traditional Chinese Medicine for thousands of years. It’s basic therapeutic properties are antioxidant, stimulating, and purifying. Its aroma range from pungent and earthy to bright and refreshing has an effect to heighten our psychic awareness, and purify the mind. Lemongrass also protects our auric field from electromagnetic energy such as TV, computers, and cell phones. So it would be a good one to wear at the airport when our bodies are bombarded with these energies. Skin: Lemongrass has antiseptic and antifungal properties. It also has good astringent properties and is an effective deodorant. Mind: Lemongrass oil has a tonic, restorative effect on the nervous system and can help with oil stress-related exhaustion, aggression, pessimistic thoughts and fear. Spiritually, Lemongrass releases resentment, regret and pessimism by transforming these negative energies into positive ones. It allows the left brain to see new options, so once the negative energies are released, optimism, courage and hope prevails. Body: Lemongrass essential oil is reputed to have analgesic properties is often used for sports massage to help relieve muscular aches and pains. 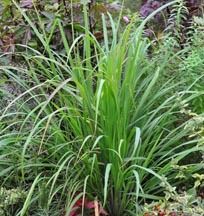 Lemongrass has been used extensively in India and Pakistan as a medicine for infectious illness and fevers and it also acts as an insecticide. The benefits of lemongrass include support for the circulatory system and may support healthy joint and tendon function. It is often included in sports massage oil blends. Blends well with: Rose Geranium, Rose, Grapefruit, and especially May Chang. Lemongrass makes a beautiful room freshener and deodorant especially when combined with floral oils such as Rose Geranium.